The skyscraper Turning Torso in Malmö illuminated by warm evening light behind modern apartment buildings. 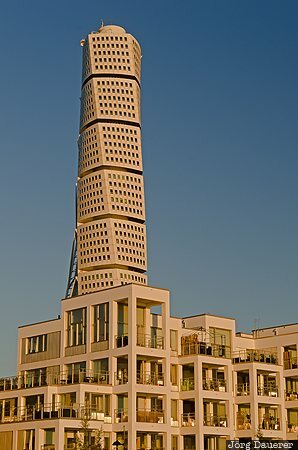 Turning Torso is the tallest building in Scandinavia. Malmö is in Skane län in the south of Sweden. This photo was taken in the evening of a sunny day in September of 2014. This photo was taken with a digital camera.